Yesterday was a tough day for me because of my old desktop computer. I couldn't boot my PC in safe mode but it was working fine in normal mode. This tutorial is written based on my efforts to bring back safe boot on my PC with some extra tips. The first part of this guide tells common reasons for getting trouble with restarting your computer in safe mode and the second part deals with solving this issue. I have Windows XP on the Desktop computer but the procedure to fix this issue is the same for most Windows Operating Systems. Even if you are using Windows 8 or Windows 7, you can follow the instructions below. These are some of the possible reasons to prevent a laptop from restarting in safe mode. Now let us check how to troubleshoot the issue, identify the reason and fix it. The first thing you must do is to find the exact reason which prevents your system from restarting in safe mode. For that, you must use trial and error method. If you have no clue on how to do it, the pattern of troubleshooting given below is best for you. The first step you have to do is to access the System Configuration page and enable Safe Boot option. You can do it by following the instructions below. If still, your computer is showing issues with safe mode booting, go to next step. Try to start your computer using these options. 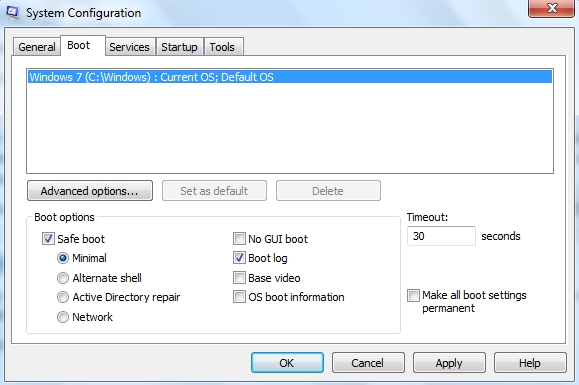 If you have failed to start your computer in all available safe mode options, it is better to try to boot your computer in last known good configuration by selecting that option from the menu. The next troubleshooting step is to run the check disk and fix the disk errors. To do this type Chkdsk /f on the command prompt. Please note that you must have the admin right to perform this task. After fixing the disk error, try to start your computer in safe mode. If the issue persists go to next step. Many users claim they had booting related issues after installing certain software products on their computers. According to many technology discussion forums, software products like DVD burning software, AntiVirus products, Data recovery products etc are accused of causing booting issues. Before jump into conclusion, I recommend you to disable each suspected programs and check the real culprit. It is recommended to perform a clean boot on your computer to identify the problem causing software. To know how to perform a clean boot on your computer, click on the link below. Wrong settings on the security software (Firewall, AntiVirus, etc..) may prevent you from booting your computer in safe mode. So make sure security product installed on your laptop is having correct configuration. Once my laptop was infected by a virus which blocked many features including safe restart. It is possible your PC might be infected and the malware is preventing it from restarting in safe mode. To remove any infection, you must perform a virus scan on your system with reputed security software(updated with latest virus signature). You must update the Operating System to avoid known bugs and other issues. I recommend you to enable the option to check for latest Windows update to ensure your computer is having the latest OS. To repair corrupted Windows files on your system, follow the steps below. If still, you have the same issue, I recommend you to follow the next instructions.